I was diagnosed just over a year ago in 2006. I was not told what PCOS is. Now I want to have a baby and realizing how serious this is. I'm so upset with my doctor for not telling me anything about this. I was told that it explained my hair-growth and acne. He put me on the Metformin, but then life happened and I quit taking it. I didn't think anything of it until now. I'm doing all this research and thinking to myself, why didn't my doctor warn me about what this can do to my body? 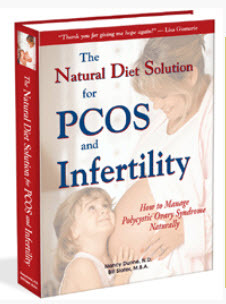 I just ordered the PCOS book and hope to have success with having a child. I'm so glad that there is a book out there that can help. I started getting scared about what I could do until one of my friends gave me an article about this website. Now I'm filled with hope and understand that I need to take care of myself now before it is too late. I'm only 23 and have plenty of more years to go. Thank you for all your work you put into this book and website. Who knows when I first got PCOS. It was diagnosed in 1999 after 3 years of trying for a baby. My gynaecologist started a regime to help me get pregnant. It included clomid, metformin, FSH injections etc and then we did artificial insemination with my husbands sperm. I know that this sounds like a long time, but it took 11 cycles over 18mths to get our first daughter who is now 5 1/2. When she was 10mths old I had a miscarriage but did not know that I was pregnant until my foetus dropped on to the bathroom floor ;( My second attempt took 6 goes over 8mths and we had another beautiful daughter who is now 2 1/2. We had decided then that we had finished our family....until out of the blue I was feeling unwell and a friend told me I was pregnant. I thought that it was not possible. But I was 9wks pregnant and gave birth to a healthy little boy 5mths ago - TOTALLY NATURALLY!!!! Take courage Ivy and never give up! I'm a 44 year "young" mom of a healthy 2.5 year old girl. I have had PCOS ever since I was 18 years old and never knew until I was 40 years old. One month after I started Metformin (this is a diabetic medication) treatment for PCOS we got pregnant. My doctor told me that PCOS is caused by unsuficcient insulin levels and that if I did get pregnant would have to stop treatment and be monitored for gestational diabetes. I wish I had known about the natural treatment then. Don't mess around with PCOS, get treatment! Since my pregnancy the PCOS has reversed it self and I no longer have to take any treatments.